One Came Home by Amy Timberlake. Review: Are you the type of person who enjoys adventure, mystery, and a quest? Well, then One Came Home that is written by Amy Timberlake is just for you. ''A sister lost, a body found, and the truth buried.Ó Agatha runs off, and a body is found like hers and nobody know the truth. Will Georgie find her sister? Is there truth? Will you find you're sister? Well, this is what Gerogie is faced to do. Agatha is a nature lover and wants to go to a university. All of a sudden there is a like a gathering of all pigeons, so many that if you tried to count them it would be impossible to count them all. As a result people from all over the country come here to visit this village. You would think this would be a good for the village so they could make more money, but certainly not for the Burkhardt family because Agatha runs off! The officer brings back a dead body with the clothes last worn by Agatha. Everybody thinks there is no doubt about it. Far form believing this is Gerogie. She is determined to find her sister. All she yearns to do is get her sister back. Will she find her sister? One Came Home is a great book that it is a page-turning mystery. The setting is intriguing that because it takes place in village in America in 1871. Some characters that are interesting are Agatha and Gerogie. Agatha sees beauty in everything she sees unlike most people. Gerogie has a Springfield rifle and shoots freakishly accurate she is too good. This story would be certainly liked by everybody. I mean who doesn't like a page-turning mystery, quest, and adventure book? It is also thrilling. Even I yearned to find out if Gerogie would find her sister? This book is undoubtedly appropriate for all ages, so as a result it is a fantastic book. One Came Home deserves 5 stars because it's an amazing book that future generations will adore and enjoy. Review written by Omar (6th grade student). We would like to thank Random House for providing a copy of One Came Home for this review. 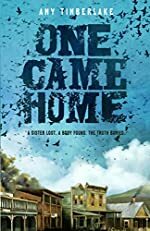 Have you read One Came Home? How would you rate it?